One of the reasons I don't like setting official reading goals is because at some point in the year, I either start panicking or I give up completely. So instead I set myself unofficial goals or guidelines that I would generally like to meet. But I realize my unofficial goals for this year - to read more authors of color, to read more from my own shelves, and to continue learning more about women's history - have started to stress me out. I am behind in both goals and I am having trouble balancing them. When I pick out a new book to read, I constantly wonder if I should pick a different one that may align better with my unofficial goals. And then I sometimes do pick a different one but am left feeling upset that I picked a book solely to meet a goal instead of just reading what I wanted. And that's really all the build-up to my picking up this book. It's been on my shelf for a long time and it's a feminist's memoirs of growing up in the Outback. That meets two unofficial goals! 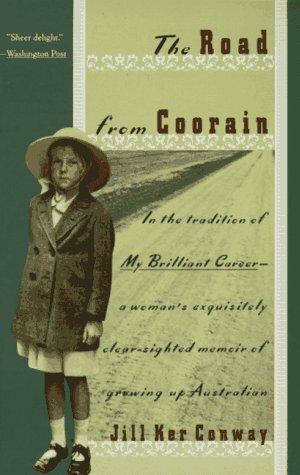 So recently, I picked up Jill Ker Conway's memoir The Road from Coorain. I first learned about this book by watching a Masterpiece Theatre adaptation of it years ago, I don't know when. I really enjoyed that adaptation as growing up in the Outback during the Depression and WWII just seemed so very removed from my own life growing up in the Chicago suburbs. Seriously, any time I read a book that takes place in the first half of the 20th century, I am just amazed by how drastically daily life has changed. I mean, outhouses. Also, telegrams. And many other things that existed not too long ago but feel like they shouldn't have. Anyway, back to the book. Conway's life growing up in the Outback was very interesting to read about because it was so foreign. She helped out a ton with the sheep farm, did school by mail, and had a very solitary but happy childhood. It was really fascinating in the way that Little House in the Big Woods is fascinating. Conway also talked about her move from rural Australia to Sydney and eventually her career in college and beyond. She did brilliantly in school and learned to think much more critically about her own schooling and her thoughts. In this part of the story, Conway's Australian pride and feminism really take center stage. She takes issue with the Australian method of teaching history from the English perspective and ignoring all of Australia's own native history. She also comes across a god amount of sexism in her quest for work, and that shapes her a lot, too. Conway went on to become the president of Smith College, a women's university in Massachusetts, and after reading this book, I can see why. She has a very solid way with words and really brought her life and all the societal changes that occurred during it to life. Conway was born of the generation that felt disillusionment with the Empire, especially as England left Australia to fend for itself during WWII. Thus, she wanted to learn much more about her own country's history and help it create a path for itself, independent of England. Similarly, she was a woman who wanted to explore her own passions at a time when feminism was budding again. She shares all of this with her readers while relating very personal stories, particularly about her difficult relationship with her own mother. Surprisingly, I didn't enjoy the second half of the book (with all the feminist, anti-colonial sentiment) as much as I did the first half. I am not sure why. I am all about women going after their goals and questioning colonial teachings, but I think that I also felt a bit like a snoop to know so much about the strained relationship Conway had with her mother. I realize that it's an autiobiography, so it's not snooping at all into things that Conway didn't want me to know, but it still felt very personal and I was a little uncomfortable with it. I preferred her happy, unique childhood on the sheep farm. This is interesting, maybe it's the time period, but I recently met someone who spoke about the lack of British history in Australia, in that they couldn't study what they wanted to. I guess the times have changed a lot. I gave up reading goals for the year because of this very reason. I rebel against every reading goal I ever set for myself. It is very consistent. Glad you liked this one. I should reread it. Many autobiographies lose steam once the person is grown. I find my reading goals are best accomplished when I forget about them! I know, weird. But then a book will pop into my field of vision and it will occur to me that it will fit my challenge and wa la! all good. I really have only been concentrating on the What's in a Name challenge and any spontaneous readalongs.